I am fascinated with French cuisine, especially their pastries makes me want to catch a flight to visit Paris within a day. However travelling to Paris is out of question for the time being at least, with two crying babies, and busy working husband with less vacation time I don’t even bother to have a dream about visits to Paris. My solution to this problem is bake or cooks your favorite French dishes at home. I tried pate choux earlier, I loved it. I tried, profiteroles, croquembouches, Swans etc. I need to try Paris-New York, Éclairs and Gougeres. For this month baking partners challenge, I selected Pate choux pastries with Éclairs and Gougeres. Moreover I borrowed Thomas Keller Buchon Bakery Book from Library, which is full of breathtaking photographs of pastries. The beautiful pastries are really hard to resist, but I don’t have any access to Bouchon bakery here? I have to don my apron and try the recipes. When I asked my hubby about Éclairs and Gougeres, he immediately nodded head towards a savory pastry. As he is diabetic, sugar is really villain to him. Then comes the hunt of Gruyère cheese, I found it in Target with a price of $ 10 for a 4 ounce piece, so drop the idea of buying it. Then I went to Wal-Mart and bought Pepper Jack cheese. Among the soft cheese we like pepper jack a lot. Spicy kick from Jalapenos is wonderful. I like Thomas Keller’s book, but don’t like his way of measuring the eggs, as we buy Jumbo egg and each egg is around 60g. I don’t want to waste extra egg, so used only 2 eggs, it turned out be fine. Gougeres are small cream puff with cheese and usually served as appetizers. According to Wikipedia, these come from Burgundy, Yonne, specifically Tonnerre. They can be really small or served with some filling like mushrooms, beef or harm. They are really cute. If you master the technique of pate choux pastry making, this is really easy to make. Ingredients needs are only flour, water, butter, egg and cheese. Skipped the pepper from the recipe as the cheese I used was Pepper Jack cheese. You can make these with Gruyère, Comté, or Emmentaler cheese, if you can’t find them use cheddar, pepper jack or any other cheese of your choice. I didn’t use my trusted Kitchen Aid to prevent extra washing step and I used a wooden spoon and hand mixed it to make this. Added cheese in the pate choux pastry and also topped with little cheese before baking. I tried piping the pastries as mentioned the recipes and also used a 1 tablespoon scoop to transfer the dough. I was really ecstatic when they start to puff up in the oven. It took about 35 minutes in my oven to get golden gougeres. They are utterly delicious when they are warm. If you like cream puffs and cheese this is best appetizer you can think about for any party. 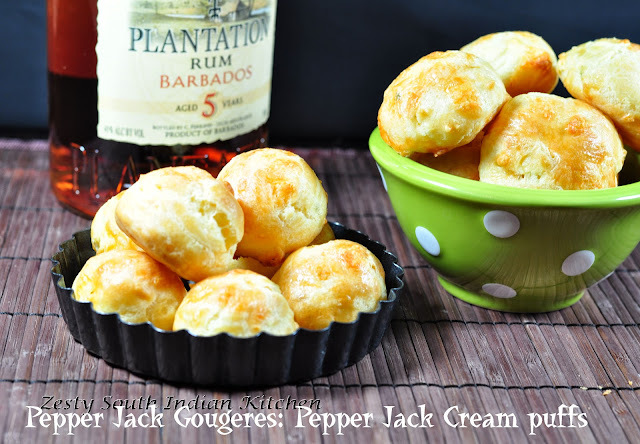 In the book, it is mentioned that you can even freeze the shaped Gougeres. When you ready to bake thaw and bake it. Goes well with any wine, my hubby fell in love them so much he even took some to office to munch on. My daughter loved it. I am glad that through our Baking Partners Challenge we are able to study lots of different baking techniques. Please make sure to take a look at fellow baking partner’s creations. Some members even veganzied the recipe. If you want to join with us for next month bakes, please shoot an e-mail. Combine the water, butter, salt, pepper in a medium saucepan, and place over medium heat and stir until butter is melted. Once the butter has melted, increase heat to medium-high and then bring to a simmer, then remove pan from the heat, with a wooden spoon, stir in all the flour. Continue to stir for 1 1/2 minutes until the mixture has a paste-like consistency, then place over medium-high heat and stir rapidly for 1 minute, until the dough pulls away from the sides of the pan and the bottom of the pan is clean. The dough should be glossy and smooth but not dry. If you want to use hand then set aside for 5 minutes and then gradually add one egg at a time using a wooden spoon mix everything well so that it gets combined. Then add about 3/4th of the cheese and mix once again to combine. Or want to proceed with your kitchen aid stand mixer. Immediately transfer the dough to a mixer bowl and mix on low speed for 30 seconds to release some of the moisture. Slowly begin to add the eggs, one at a time, beating until each addition is completely absorbed before adding the next one. Continue adding the eggs, mix until the dough pulls away from the sides of the bowl pulled with the paddle but immediately grabs back on again. Preheat oven to 350F and line a baking sheet with parchment pepper or silpat. If you want you can freeze the gougeres for about four hours until firm. Or you can bake them right away. Preheat oven to 350F. Bake for 35 minutes or until it become golden brown if you are baking immediately. If you are baking the frozen one, preheat the oven to 375F. Line the baking sheet with frozen gougeres, leaving about 1 inch between them. Spray lightly with water. Place in the oven, immediately lower temperature to 350F and bake for 25 to 30 minutes until golden brown. Serve warm. Fabulous and love the add on of cheese inside. 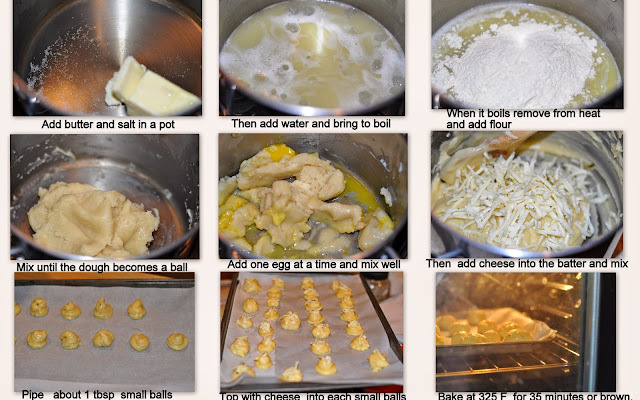 I think (yes,I think) I should be able to replicate this recipe and thanks for the step by step process. These looks are puffy and that light brownish tone on top makes them so attractive. Fantastic gougères. I also love French cuisine. I’m willing to take part in next challenge. Have a wonderful weekend! That’s a real challenge!!! So well made..
cute tempting and delicious puffs. 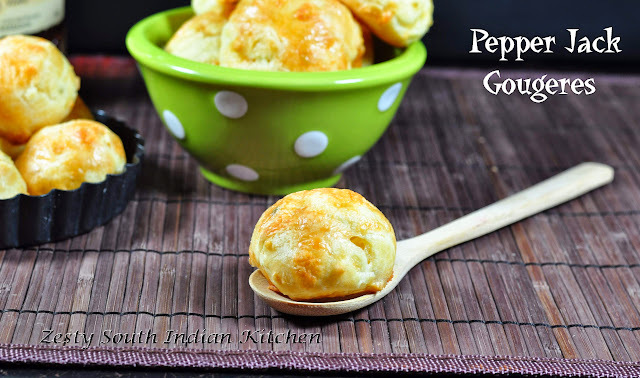 Hi Swathi, your gougeres look wonderful. thanks for th challenge. it was such a lovely treat. 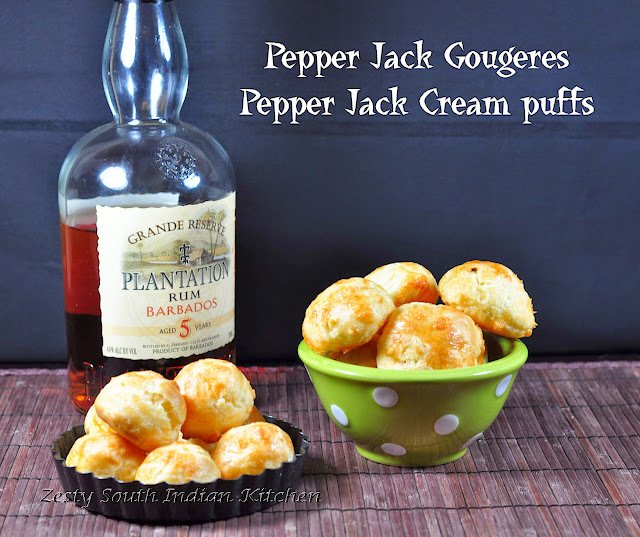 i have posted the gougeres now and will try and do the eclairs as soon as i can. hopefully by tonight or by tomorrow morning. have a great day ! Gougeres looks crunchy and perfectly textured!! Very nice clicks!! A perfect snack with a sup of tea! I like pepper jack cheese, they are a winner hands down!! Those look great and I love the idea of using pepper jack cheese. Wow Swathi,looks so yummy,looks crunchy and love the cute shape. Great challenge this time Swathi,really enjoyed. 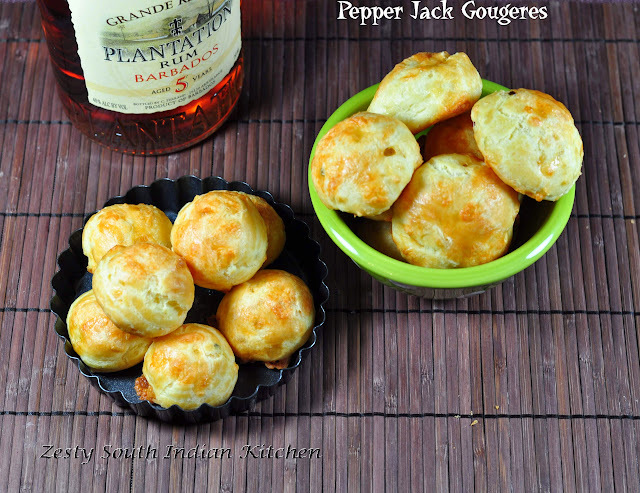 Wonderful cheese gougeres swathi, Wud luv to have it with tea! Looks wonderful Swathi.. Perfect little bites of savory it is !! Love this savory twist. These look perfect! I am so happy you chose this Swathi! I have been wanting to make Gougeres for so long and was always intimidated. They were a lot easier than I thought and I’m ready to move on to eclairs next. Your pepper jack version looks delicious! Love that spicy kick! The guorgeres look so perfect. after checking yours I am rethinking to make this also. they luk just out of the world !! great jackies ! They look so good. Man, I wish I could eat Gruyère cheese, it’s so darn tasty! Silly stomach! I could eat a dozen of these in just one sitting! Great answer to the challenge! Love your pictures almost as much as the cream puffs! this is new to me..but looks tempting.. They look lovely Swathi, need to try them soon! Looks very tempting, perfect appetizers.. Very cute and inviting puffs Swathi. Lovely clicks dear.